AVG is providing a free edition of Antivirus 2012 version for free with best features, options, improved performance, faster scans, stunning user interface. AVG Antivirus Free Edition 2012 offers high quality basic security for your computer like browsing, social networking, etc. With its modern Protective Cloud Technology, AVG removes those viruses which are residing in your PC for a long time. AVG Antivirus is known as one of the popular protection suite, since many years, and it is improving the performance and features whenever a new version of Antivirus or Internet Security or Basic Edition is released. AVG Antivirus Free Edition 2012 is the latest version delivered with many changes and improvements. AVG Antivirus Free Edition 2012 takes less than 5 minutes to Download & Install. Installation screens has been reduced from 13 to 5 since it is consuming more time. Close all sorts of programs at the time of Installation, especially don't open internet browsers. AVG's Security Toolbar and Secure Search default search engine are optional settings you could choose. No serial or activation key is required as this is a Free Edition with basic protection. You can opt for a 30-day trial version of AVG Antivirus which offers more features to Free Edition. Few changes are done to this latest version, but the performance and usability is improved a lot. 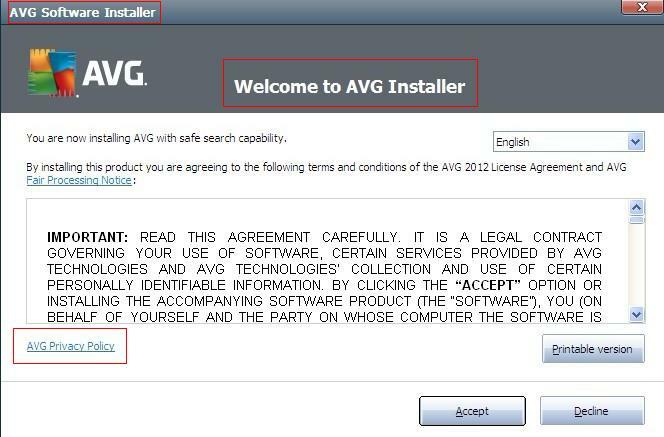 Remaining parts of the Interface is much similar to AVG Antivirus 2011, so the users who are adapted to the prior could use this AVG Antivirus Free Edition more effectively and easily. Just one click is required to Fix the repairs & errors and for updates. Security Component Icons and Settings are arranged quite cleanly for easy navigation. 2012 Free Edition of AVG Antivirus has amended a lot and said to be the best Performance-oriented security suite developed. Shut Down Time and Boot Time has been decreased compared its last years. On the other hand, Scanning takes very less time to process, both for moderate and deeper scan. As this is a Free Edition, AVG Antivirus offers best protection when you are surfing, searching internet and at the time of social networking. 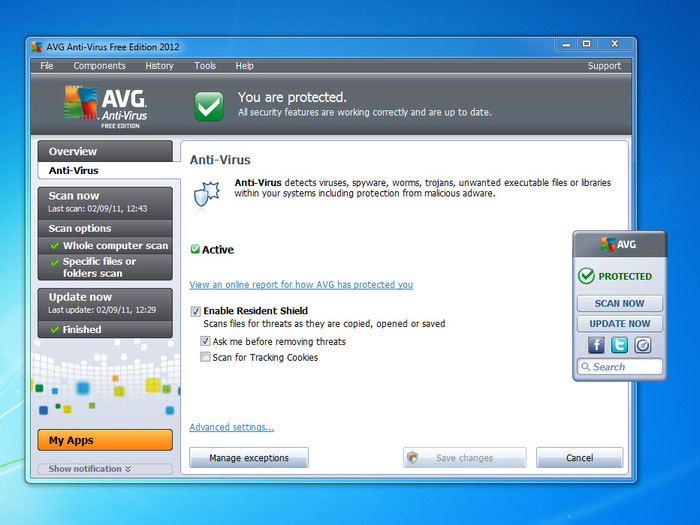 Lets look at some of the best features of AVG Antivirus Free Edition 2012. Improved AVG LinkScanner Tool for dynamic protection against increasing threat rate. AVG Accelerator option - Optimizes and speeds up the internet connection. Works only on YouTube and Download.com. AVG Advisor or Browser Monitoring Tool - track the consuming memory of internet browsers and it shows alert or pop-up when the memory is increased. Smart Scanning - Scans all files at once and re-scanning is done only if behavior detection is changed. System Resource Manager - Prioritizes and Schedules Scan. It takes very less resources to run the manager, not consuming more memory. PC Analyzer - Scans and removes registry & disk errors. Firewall and Anti-Spam Protection Tool. To get more features and specifications of AVG, upgrade to paid version which gives you advanced options for PC security. This antivirus software is supported in Windows 7, Xp and Vista operating systems. 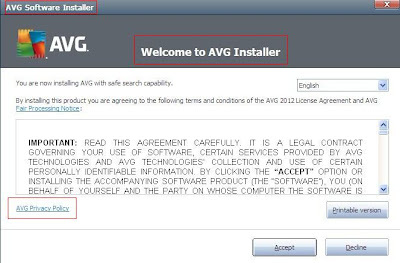 You can download AVG Antivirus Free Edition 2012 for free from below download link. It downloads a small installation file. Running this file redirects you to Download.com for completion of the rest.